These are among the findings of the Society for Information Management’s (SIM) 37th Anniversary IT Trends Study, which is being released to SIM members this week as a lead-in to next week’s annual SIMposium conference that’s taking place in Connecticut. Non-members can get a peek at the study next week. The grabbiest element of the wide-ranging survey, taken by 1,213 individual SIM members (including 490 CIOs) at 801 mostly U.S.-based organizations, is a section on “Most Worrisome Technologies” (i.e., “what keeps you up at night”). Keep in mind that we’re talking about pretty big organizations here: their median revenue is $500 million and their median annual IT spending is $10 million. 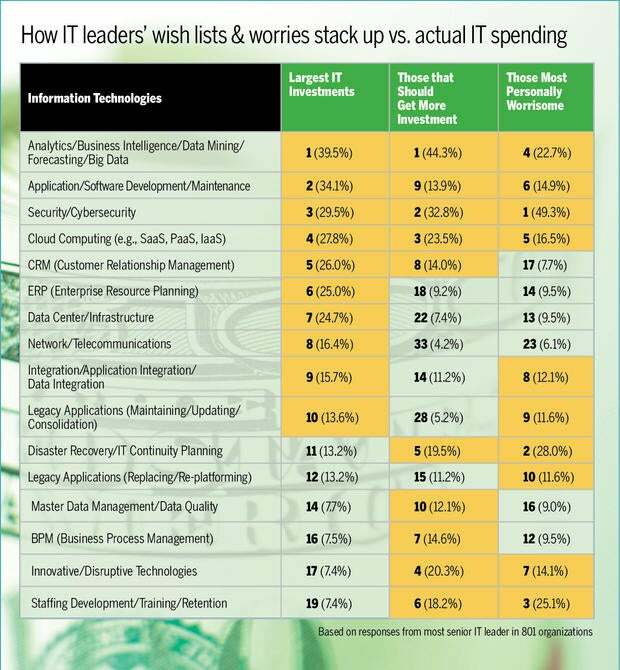 As for staffing, the fact that IT leaders consider it a huge worry isn’t surprising – it ranks 19th out of 19 on a list of organizations’ largest actual IT investments (decisions on which are typically shared among CIOs, CEOs, CFOs and other executives). “This is likely troubling to IT leaders as the capability, quantity and satisfaction of IT personnel within the organization affects the ability of the IT organization to engage in important projects in a timely manner to deliver business value,” the survey reads. A similar sort of discrepancy, between IT leaders’ worries and actual IT investments can be seen for IT continuity planning/disaster recovery. “Time will tell if the recent IT debacles at both Southwest and Delta airlines may change this situation,” the study reads. The same three most worrisome issues have been among the top 3 for 4 straight years, with only Innovation as a newcomer to the top 10 this year. While CIOs have plenty of day-to-day operational concerns, including business continuity/disaster recovery, the fact that Innovation has cracked the top 10 issues shows that IT leadership is looking strategically to the future as well. In fact, when asked about what technologies organizations should be investing in, innovative/disruptive ones came in at #4, whereas they’re way down at #17 on the list of largest actual IT investments (analytics/business intelligence/big data is #1 on both lists). Kevin More, chairman of SIM and CIO at healthcare/human services non-profit May Institute, puts an emphasis on innovation both in terms of delivering tools that direct care staff needs in working with clients with autism and other special needs and in terms of providing general IT support to employees. For example, May Institute partnered with a software company to pilot mobile apps used by direct care staff, such as therapists, for data collection for applied behavioral analysis. On the IT support side, May Institute has created videos to help employees get up to speed on new technologies, all the while balancing training needs with compliance rules. "We think: 'What's the kind of Amazon experience that we can give our users to make their jobs easier? '," he says. The other huge data point on the IT investments front that was surfaced by the study is that spending is shifting big time from hardware/software to cloud computing, including ERP and other financial apps. 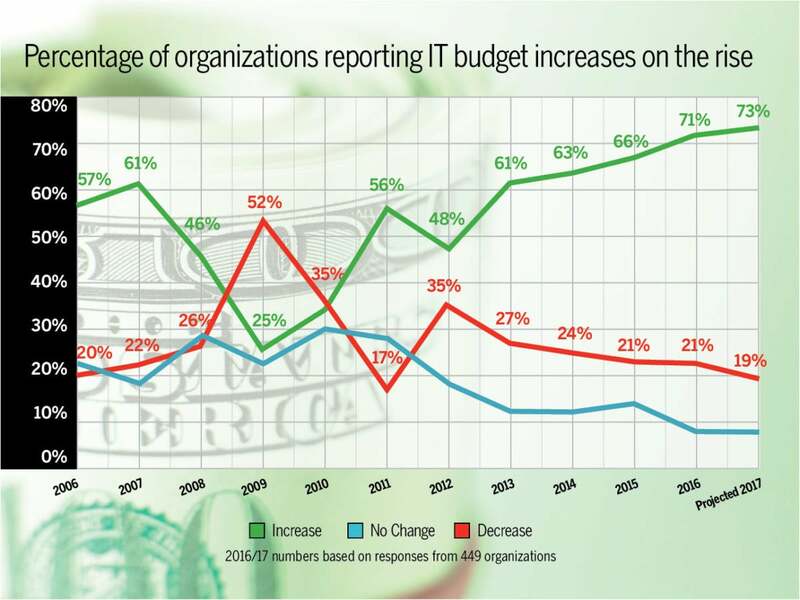 Overall, the percentage of respondents reporting an increase in IT budgets rose from 66% last year to 71% in 2016 – the largest percentage of organizations reporting increases in the last 11 years. More and more of that funding is headed to the cloud, with cloud spending going from 7.7% in 2015 to 12.1% in 2016. Respondents say they expect that number to rise to 15.1% in 2017, which would be about a 25% increase year over year. Fueling cloud expenditures has been a shift from business unit-specific cloud spending at the start to more enterprise-level SaaS purchases of late. In 2016, nearly a third of all IT services were delivered via the cloud, according to survey respondents. 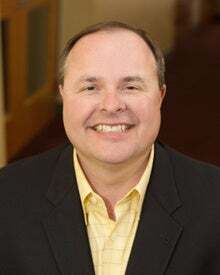 May Institute leverages cloud computing as much as it can, for applications such as electronic health records and payroll, and the shift has had a big impact on how IT staff does its job. "A lot more things are not in your control as much as they were in the past," says More, adding that a disaster recovery plan still needs to be in place. "There's a handful of things we still build ourselves, but a lot of our development team's time -- I'd say 40% to 50% -- is on integrations as opposed to doing code and building systems," More says. Despite, or perhaps because, of all the challenges facing CIOs, people in these positions are staying in them longer, the survey finds. CIOs surveyed stay in their jobs an average of 5.63 years, marking the third straight year of increased tenure. Not surprisingly, most of the CIOs surveyed are male (87.8%) and their average age is just over 50 (SIM Women is among the organizations looking to address gender inequality in the profession). Evidence is mounting that CIOs are getting a seat at the top executive table, with 46.3% reporting to the CEO, up from 42.9% in 2015. CIOs are also spending an increasing amount of their time with other C-level execs, according to the study. The survey data reveals that fewer CIOs are coming from within IT (82.5% in 2016 vs. 91.6% the year before). Such numbers “could indicate an increasing demand for a different kind of CIO, as well as insufficient CIO ‘bench strength’ within in-house IT,” the survey concludes. With innovation, the cloud and cybersecurity threats all on the rise, it's no wonder a different kind of CIO is in demand.